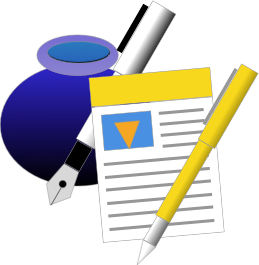 “Converter for Pages” is an App that allows you to quickly and easily convert Pages 3.x (iWork 2008) and Pages 2.x (iWork 2006) files to Pages 4.x (iWork 2009) You can then open your old Pages documents in the latest version of Pages or iWork. If you try to open a treasured document, maybe an old school paper or important legal document you will get the error “This document can’t be opened because it is too old” error. 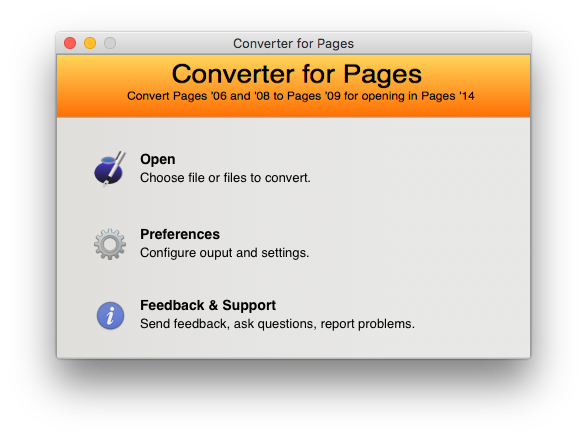 Pages Converter lets you upgrade old documents without Pages ’09. If you do not have “Converter for Pages” you will need to install iWork ’09 first. This App will save you time and money. This useful and easy to use utility stops you having to buy or install iWork ’09 just for this simple task. It also allows batch migration of files from Pages 06 or Pages 08 to Pages 09. If you do not have Pages ’09 on Mavericks (OS X 10.9) or Yosemite (OS X 10.10) then you will be stuck. Or perhaps you have the install media for Pages ’09 but no CD Drive in your MacBook anymore…? You can only solve this problem by spending lots of money on hardware and software you don’t really need. If you have an old Mac with Pages ’09 you would have to spend time dusting it off and getting it to work again. Or you could just use this converter. Fast and quick, and your problem is over in seconds. Batch conversion or upgrade of files from Pages 06 or 08 to Pages 09. Fast, easy conversion. 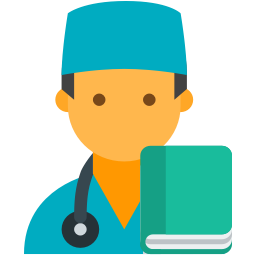 Using an enhanced process conversion is usually completed in seconds. We offer full support for this converter via our website. Open directly in the latest version of Pages, or assign a folder to convert to. Peace of mind that your old documents can still be used. All conversion is performed on your Mac. This App does not send sensitive information across the Internet. Please note, you will need to purchase a license to use Pages Converter. You can download Converter for Pages, but you will need to register before you can convert your presentations. Your purchase receipt will have a link to download the installed. Download the installer from the link. Make sure the Installer is uncompressed. Double-clicking on the installer will un-compress it. Enter your registration details, and then start converting your old Keynote files…! Enter your address to download Converter for Pages. However, you will need to buy a license to use this App. 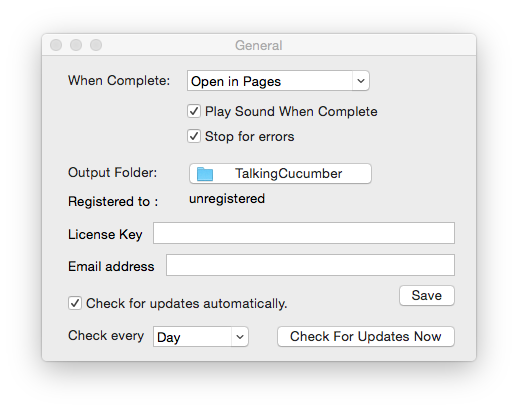 We will only use this email address to tell you about news at Talking Cucumber and nothing else...!